BalloonGrip™ is the world’s first cardboard engineered balloon holder, designed to secure and distribute air inflated latex balloons for giveaways and promotions. Answering the urgent need for an alternative to plastic balloon sticks, the fully patented* BalloonGrip™ is made from sustainable raw materials which can be fuly recycled. Easily assembled for high volume balloon giveaways and suitable for both children and adults, the BalloonGrip™ is currently available in plain white, colourful party colours, or a natural wood effect. 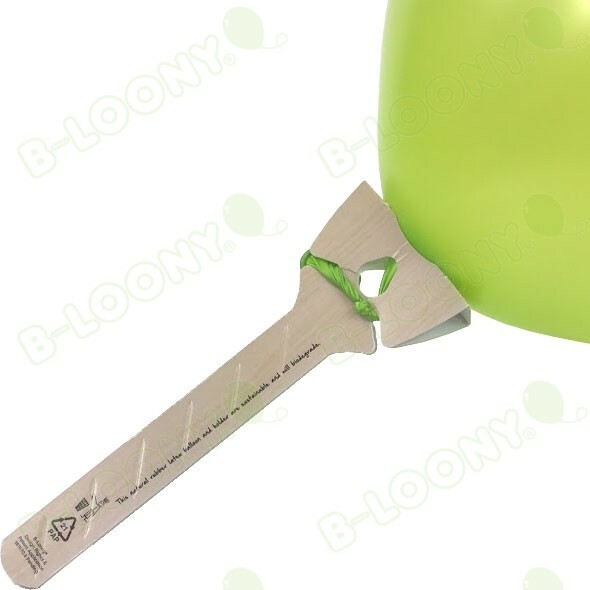 We've launched its latest innovation to the world of party and promotional products, the eco-friendly BalloonGrip™. Answering the urgent need for an alternative to plastic balloon sticks, the fully patented* BalloonGrip™ is made from sustainable raw materials which are fully recyclable using domestic recycling facilities. Easily assembled for high volume balloon giveaways and suitable for both children and adults, the BalloonGrip™ is currently available in plain white, colourful party colours, or a natural wood effect. A huge advantage over the traditional plastic sticks is that the BalloonGrip™ itself can be custom printed for sales promotions with brands or even competitions. We’re thrilled to be launching BalloonGrip™, our new sustainable balloon holder at the European Trade show, PSI in Dusseldorf. Many of our existing clients have already pledged to reduce their use of single plastics, and with BalloonGrip™ we can offer an affordable, eco-friendly alternative that allows them to continue planning popular branded marketing activities for their customers. It’s important to remember that latex balloons are made of natural rubber so, combined with our BalloonGrip™, you have a new completely sustainable and eco-friendly product. It is a common misconception that balloons are made from plastic. In fact, natural rubber latex balloons are biodegradable, and offer very low cost and popular branding opportunities due to their wide range of stock colours and ability to be customised with logos or bespoke designs. By introducing the flat-packed cardboard BalloonGrip™ as a partner product to balloons, B-Loony is also offering clients savings in packaging, storage and distribution costs, compared with the previous plastic alternative. For more details, please visit call 01494 774 376 or visit www.balloongrip.co.uk.